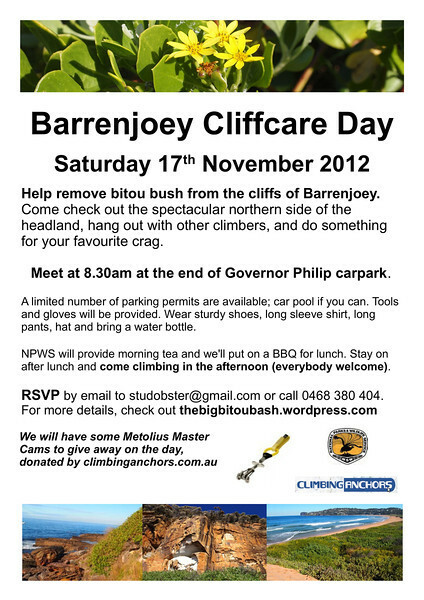 Come along on Saturday 17th November to Barrenjoey, to join with the rangers to help remove bitou bush and asparagus fern from the headland. A great way to see the northern side of the peninsula (the rock architecture is awesome and its very pretty out there), hang out with climbers, make friends with the Northern Beaches rangers, learn a little about the headland and its fascinating ecology, and do your bit for climbing access. Plus you get to go climbing too! Meet at 8.30am at Governor Philip's Carpark for the briefing. Limited number of parking permits are available, but car pool if you can. Tools and gloves will be provided. Wear sturdy shoes, long sleeve shirt, long pants, hat and bring a water bottle. You don't need any previous experience doing bushcare, instruction on spotting and removing bitou, spag and lantana provided. It's not hard, anybody can do it. NPWS will put on a morning tea, and we'll do a BBQ for lunch. Stay on after lunch and come climbing in the afternoon. Beginners welcome, but there is plenty for hard dudes to do too. Check out the guidebook online. RSVP to studobster@gmail.com so we can tell Parks how many mountain goats are coming. Everyone please post your favourite Barrenjoey climbing pics to get everyone psyched! Bugger. That's the same day as the last round of the Sydney Bouldering Series. Ooops. Oh well, there will be more days hopefully. your doing well for a schoolie dr nick comping. Good luck. Good idea. Doesn't hurt to have a bit of cred with the rangers. >Doesn't hurt to have a bit of cred with the rangers. >>Doesn't hurt to have a bit of cred with the rangers. What? You mean the rangers would have more cred with climbers if they banned climbing there? Do I need more / stronger coffee? I'm stoked to announce that climbinganchors.com.au is supporting the event by providing some awesome spot prizes for volunteers. 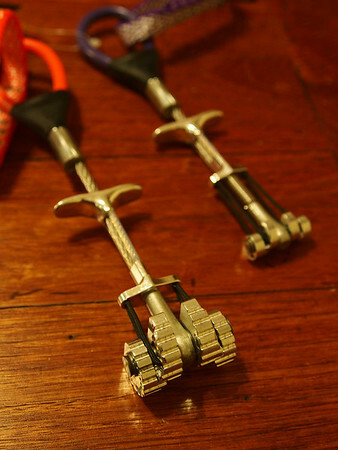 Rumour is they are spanky shiny new Metolius master cams! Wooohoo Steve you rock!! >banned climbing there? Do I need more / stronger coffee? Sounds like you've already taken too much of something. Could anybody on the north shore lend a hand and drop some flyers off at the north shore climbing gyms? I can email you a PDF. i think the blog page has been well set up! thou it needs more traffic. We have a limited number of car parking permits to use. If you want to avoid the parking fees its best if we all car pool. If you aren't yet in a car with others and want to car pool, post here where you are coming from and if you need or have space. I am coming from Ashfield and can currently fit two more in the subieroo. Is anybody coming from eastern suburbs or inner west who has a space in their car? Looks like the rain will pass tonight and tomorrow will be a good day, so weeding and climbing at Barrenjoey is still on.